party on April 7th, 2013. He was received by the Distinct Secretary Comrade G.M.Jayasundara and other leaders of the District Committee. The District leaders of the S.L.F.P, L.S.S.P and Democratic Left Front participated. 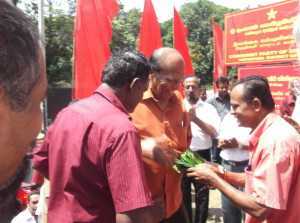 The Party Organizer Comrade A.G.Jayasena accompanied the General Secretary.